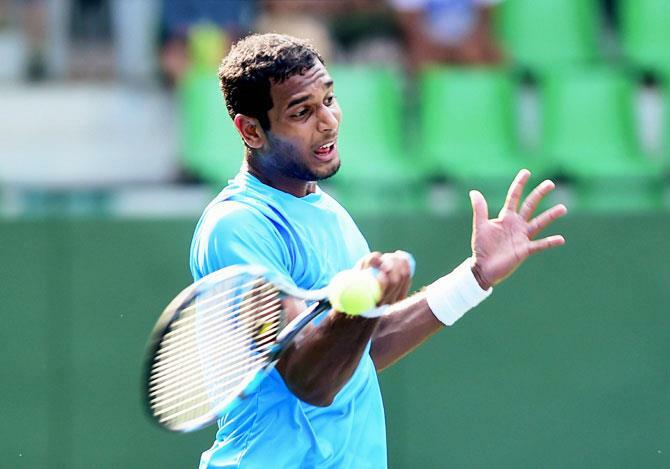 Chandigarh, Mar 19: Winning a total of 64 points out of 116, 12th seeded Indian Prajnesh Gunneswaran of India took 74 minutes to dispose of the challenge of Adrian Menendez-Macerias of Spain in straight sets 6-2, 6-4 in the qualifying singles first round match in the $8,359,455 ATP Challenger 1000 Miami Open Tennis Tournament here. Adrian won a total of 52 points out of 116 and saved one out of six break points and saved five out of nine break points. Prajnesh won four out of nine break points an saved five out of six break points. Prajnesh fired six aces and committed one double fault. His opponent in the second round qualifying round is wild card holder Jay Clarke of Great Britain. Ramkumar Ramanathan of India lost to 18th seed Italian Lorenzo Sonego in straight sets 6-4, 6-1 in the first round qualifying round outing.